— Hamlet, Act II, Scene ii, Hamlet . The curtain is up, the play has begun… and the work of the Klingon Shakespeare Restoration Project is now available to a wider audience, courtesy of Pocket Books. This trade paperback is an updated version of our earlier publication, a limited hardbound edition of 1,000 numbered copies, plus 26 numbered deluxe copies. Only a handful of those remain, but the new trade paperback can be found in major bookstores and also right here at the KLI’s own merchant page. The original edition of the book went through years of translation and several revisions, with translators Nick Nicholas and Andrew Strader aided by feedback and editorial assistance from Mark Shoulson, d’Armond Speers, and Will Martin. Translation by committee is a tricky thing, but Hamlet represents the largest piece of text in Klingon to date and we wanted to be as grammatically accurate as possible. That concern resulted in several hundred changes to the text when Pocket Books expressed an interest in publishing a trade paperback version. In the intervening years Klingon scholarship had revealed new insights into the language and we insisted on incorporating them into the new book. Nick Nicholas and Lawrence Schoen expanded the appendices for the new edition as well, giving further insight into the play and its context in the larger scope of Imperial and Federation politics. 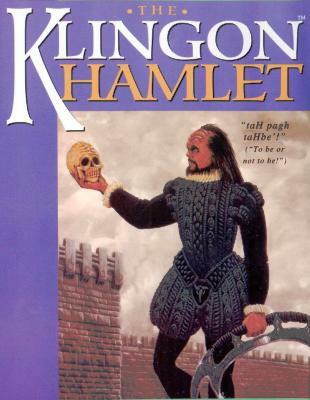 You may think you’ve read Hamlet before, but you can’t really appreciate it until you’ve read it in the original Klingon. Now’s your chance. Enjoy!